When you think of a clamshell design for a handset, you usually aren't expecting a smartphone. And if the voices inside your head are whispering smartphone, smartphone when you look at a clamshell, it usually is an entry-level model that has you obsessed. 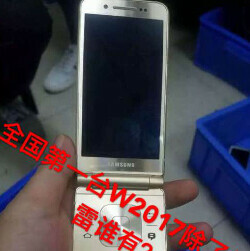 The Samsung Galaxy Folder 2 and the first generation model would be prime examples of that. But Samsung apparently believes that people are generally nostalgic, and that a high-end clamshell phone could be a winner. Just yesterday, we showed you some live images of such a unit, which has the nickname "Veyron" and carries the model number of SM-W2017. Today, we have some more images of the phone for you to look at. We expect the Veyron to carry a 4.2-inch screen with a 1080 x 1920 resolution. The Snapdragon 820 chipset will equip the handset with a quad-core CPU and the Adreno 530 GPU. 4GB of RAM is inside along with 64GB of native storage. The 12MP rear camera includes PDAF, and the 5MP front-facing snapper handles selfies and video chats. Keeping the hamster wheel spinning is a 2000mAh battery. A fingerprint sensor is included. We aren't sure if the Veyron is going to be offered in the states, but we can see the interest in a clamshell phone that brings back memories of the Motorola RAZR V3 while having the capabilities of a modern high-end Android smartphone. An unveiling of the SM-W2017 could be just around the corner. I really think at least budget flip androids need to come to the US, perhaps US Cellular, TracFone, and GreatCall can oblige...? Would definitely be interested, the flip form factor makes a lot of sense for calling, also the buttons could definitely be useful. Maybe this one won't explode. Depends on how you hold it. And your retaliation is garbage. Upset about the exploding Note 7, "Samsung quality" that you can't take a joke? Maybe you didn't read his comment. He's sad not upset. BTW, you're not much different by justifying a troll comment which has nothing to do with Note 7 or explosion. Get a new gig, instead of borrowing it from someone else.